Robot vacuums range in price from $50 to nearly $1,000, so some people think that you have to pay at least a few hundred dollars for a decent model. Good news: that’s not the case at all. If you don’t need fancy features like laser guided navigation and automatic recharging, there are some great options out there that cost way less than you might think. 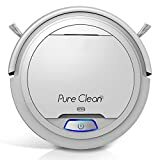 One great example is the new Pure Clean PUCRC25 Robotic Vacuum Cleaner, which is on sale right now on Amazon for only $90!